Posts Tagged "Decorated Mini Veils"
Home » Posts Tagged "Decorated Mini Veils"
Trend Alert for Brides. Naeem Khan’s decorated jeweled mini veils looked stylish and romantic as shown at his New York Bridal Fashion Week Show for Fall 2018. 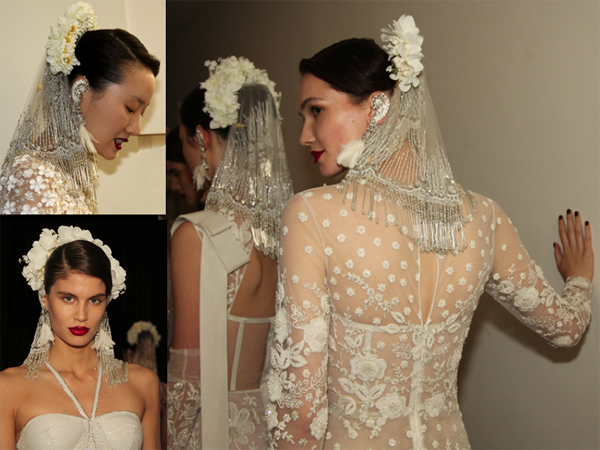 The glittering veils, which rested over a high bun by Jon Reyman, were worn with floral headpieces and stunning earrings, all made by the designer, who showed his breathtakingly beautiful collection in his showroom. The bridal gowns included floral embroideries and appliqués, some with metallic threads, raffia, ruffles, pleats, lace, crystals, cascading ostrich feathers on ball gowns. Stay tuned for more from this collection.